The excitement starts as soon as you thumb the starter button. Within a few minutes, you will find yourself gliding through gentle sweepers on a traffic free two lane strip of asphalt as you head for one of the many incredible destinations that are within a day’s ride of the Oakhurst area. If you enjoy riding a motorcycle, as I do, you will love the opportunities that await you. You will have many beautiful places to visit like Yosemite National Park. The southern entrance to Yosemite is only 13 miles from town. As you ride through Yosemite Valley, you will be blown away by the splendor of it all. 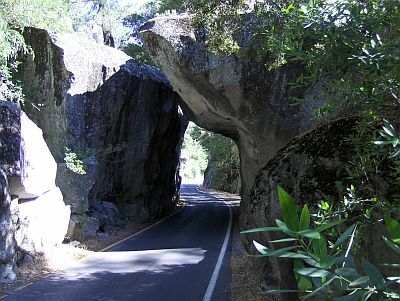 But before you enter the Valley, you will want to take the turn-off that will take you to Glacier Point. The ride up to the point is outstanding. As you climb up to over 7,000 feet you will be treated to an electric blue sky. You will find yourself stopping at nearly every overlook, as it’s impossible to get glutted with the fabulous scenery. Just after dragging your foot pegs through a series of pine tree shaded twisties, your eyes will suddenly be filled with the image of one of the world’s largest granite formations, Half Dome. This huge chunk of granite towers over 4,000 feet above the valley floor. You will find a photo of Half Dome on this web site. The day I took this picture the big rock was framed by an azure sky and crowned by cotton ball clouds. After taking in the view of the valley below from Glacier Point, you will want to head back down to the valley floor where you will be taken in by the splendor of the waterfalls as they tumble down the granite walls. The water from the falls finds it way into the Merced River as it lazily flows through the valley. You will also be able to witness the daredevils as they make their way up the vertical granite walls of El Capitan. 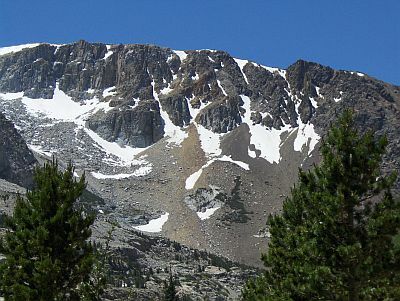 Upon leaving the valley floor, you will want to take the magnificent ride over Tioga Pass. The wonders of this road as it climbs to over 9,000 feet are just too numerous to adequately cover in the space available. On this twisty flowing ribbon of asphalt, you will find yourself riding through a deep rich forest of towering pines, outcroppings of granite and you will be greeted by the sparkling waters of Tenaya Lake. The waters of this beautiful alpine lake seem to shine with an exotic intensity from its blue depths. There are benches and tables at the lake so if you happen to have brought a lunch; this is where you will want to enjoy it. After leaving the lake, you will be treated to more miles of twisties and sweepers that are bordered by bluffs and low stonewalls that look like jigsaw puzzles of colorful granite. Next, you will find yourself passing through Tuolumne Meadows. The meadow is filled with blooming wild flowers that were haphazardly strewn and seeded by the wind. After traveling about 6 more miles, you will find yourself approaching the east gate of the park. At this point, you will need to decide whether you want to turn around, or continue on. If you decide on the latter, you will pass by another beautiful body of water (Tioga Lake). Tioga Lake is framed by glacier capped Mt. Diamond. You will then be descending down a winding asphalt path that will drop you 3000 feet in about 6 miles. At this point you will hit Highway 395. If you make a left, you will be in the town of Lee Vining. After a brief visit here, you will probably be ready to do a 180 and back track home. 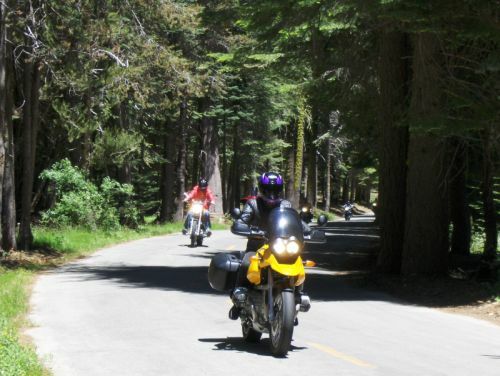 Kings Canyon and Sequoia Park are within a long days ride from Oakhurst. I’m not as familiar with these parks as I am Yosemite, so I will leave them to check out for yourself. We are also fortunate to have many beautiful mountain lakes nearby: Bass Lake, Shaver Lake, Huntington Lake, Courtright and Helms Lake. There are outstanding bike friendly, traffic free roads leading to these lakes making them a must to visit. Oakhurst is located in the heart of the historical gold rush country. Highway 49 (also known as the Golden Chain Highway) starts in Oakhurst and continues on for miles. It passes through dozens of the old gold rush towns; time seems to have stood still in many of them. These picturesque old cities reflect the classic character of the gold rush days. Ride safe and keep the shiny side up.